Grub worms, the the larvae of Japanese beetles, are a scourge to any healthy lawn they invade. These C-shaped creatures are off-white in color with darker-colored heads. 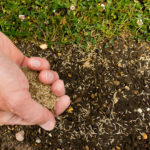 When lawn grubs hatch they immediately begin to feed on plant roots, eventually destroying large patches of your lawn, especially when they exist in large numbers. 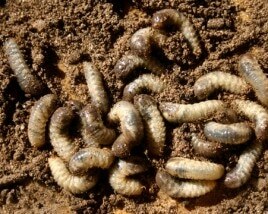 Read on to learn about how to keep your grass in good shape by getting rid of grub worms. Summer: Mid-summer is when Japanese beetles lay their eggs in sunny spots on a lawn. This means it’s time to act if you see signs of grubs. It can also be beneficial to take preventative measures if your lawn has fallen prey to grubs in the past. Spraying adult beetles during the summer can prevent hundreds of eggs from being laid, which prevents hundreds of adult grubs from plaguing your lawn the next season. Autumn: Early autumn is the next best time to control your grub worm population, as this is when larvae are still small and are living close to the surface of your soil. Insecticides can be applied to the top of the soil to kill off both beetles and grubs. Spring: spring is the least desirable season to treat for grubs. At this time of year, the bugs much less susceptible to insecticides because they are larger in size and are not feeding. Frequent rainfalls can also wash away the treatments, rendering all your hard work futile. Commercial-grade fertilizers containing insecticidal granules. Insecticides containing imidacloprid or halofenozide. 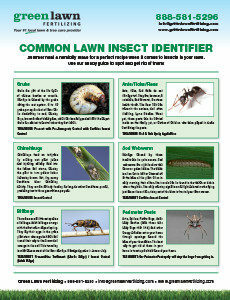 A well-maintained lawn can help prevent a number of lawn diseases and infestations, including grubs. Avoid overwatering: excessive rainfall and watering help grub eggs hatch. Avoid daily waterings. Fertilize: autumn and spring fertilization are beneficial to your lawn and can encourage thick turf that will be less attractive to beetles. Mow high: beetles avoid longer grass when looking to lay their eggs. Keep your mower set to a higher level to avoid creating a hospitable environment for beetles. Call Green Lawn Fertilizing at 888-581-5296 for any additional information. We’ll work with you to ensure that your lawn is green, healthy, and grub-free.